Why are my tools not displaying on my website? OR you can open website in private/incognito browser window (for temporary browser cache issues). To open Chrome/Firefox private browser, go to top right corner of browser, look for 3 dots (chrome) or 3 bars (firefox) and right click. Choose “New Incognito Window” or “New Private Window”. If you ‘X’ (close) your tools, they will not display again for 1 session (session length depends on browser settings). 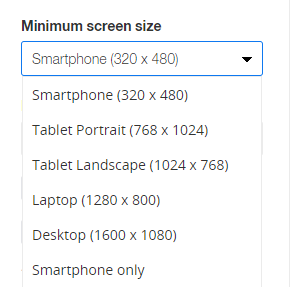 Some tools do not display on smaller mobile screens. Please double check the “Display Options” on the setting page for each tool. Some tools such as popups will only display once per session to avoid annoying your customers. For example, IF you browser ‘remembers’ your tabs when you reopen your browser it will be the ‘same’ browser session. You can select to display tools ‘once per day/hour’ on the display options IF you would like certain tools like popups to appear more frequently. If you enter your email, the tool will NOT display again (to avoid annoying your new subscribers). Please test in private browser mode. Shopify does not display 3rd party tools on their checkout page (only cart page and other pages). 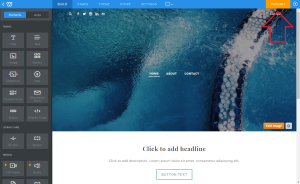 For WordPress users, some custom themes may conflict with our app. Please install our embed code manually and clear and delete your cache. For Weebly users, please ‘publish’ in your weebly admin section after installing our app and saving and turning ON tools. For Big Commerce users, please embed our code again if you change your theme. If you have an Ad Blocker extension in your browser, please disable it. If you have a stand alone website, please ensure the zotabox code is embedded in your website footer (html source) https://zotabox.com/dashboard/embeddedcode/. Zotabox tools will not load if embedded inside an I-Frame. Will zotabox affect my site speed? Zotabox tools load asynchronously and will not affect your website loading speed. Facebook’s script (for live chat) may take some time to load, BUT will load AFTER your general website script is loaded so will not affect your user’s general experience of your website. All our static resources are delivered through premium CloudFlare CDN and using dynamic browser cache. We have developed our ZB Framework / micro services that uses the latest NodeJs, PHP, MySQL, NoSql, PM2 technology to deliver maximum performance and the quickest load times. Our loading speed maybe affected by other 3rd party tools. Please delete unused tools or consider using a CDN system like CloudFlare to speed up loading static resources. Shopify merchants can also embed our code manually to speed up loading times (if you have multiple apps installed on your site). Third party widgets like Facebook and Google may take longer to load first time but load faster for your repeat visitors. You can get suggestions to improve your website loading speed here. You can also test your website performance without Zotabox tools by adding #zbstop in the end of your website URL. Zotabox also has flexible display rules to maximize customer impact. What happens if I reach my customer visit limit for the month? Your Zotabox tools will be automatically turned OFF if you reach 120% of your existing plan visits for the current month. For example on our starter plan, your Zotabox tools will be turned OFF when you reach 3,600 website visitors for the current month (18,000 for the express plan etc) . You will be sent reminder emails automatically when you reach 95% and 120% of your visit limits for the current month. Your limit will be automatically reset to zero at the beginning of the next month (12:00 am GMT) and your tools will be automatically displayed again. Our pricing plans are based on general website visits (not tool impressions or clicks) to easily compare with your Google analytics and to avoid complications with multiple active tools and complex display options. There is no website visit limits while on our 14 day premium trial. To increase your monthly limits, please go to our pricing page. To get promotional ideas for your website see our promo idea page. To see your current plan, please go to your account page. A website visitor is calculated only ONCE per 24 hours, so if your customer makes multiple visits to your site in 1 day this is only considered 1 Zotabox website visit. You can compare your visits with your Google Analytics (ours should be lower). If you see a large discrepancy, please give us a screenshot of your Google Analytics – Audience – Overview – Sessions – current month. Can I display tools only on certain pages? 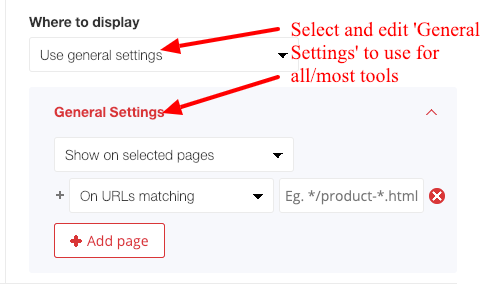 Please select ‘Show on Selected Pages’ on your display options on the setting page. You may also set up a ‘General setting’ if two or more tools will have the same display options. Please see our tool tips for each display option. To select a group of pages please use an ‘*’. Ex /blog* for all pages with /blog in your url. For more Display Options, please see our Display Option User Guide. Do zotabox tools display on mobile devices? Some tools do not display on mobile devices because they do not look good on smaller screens. 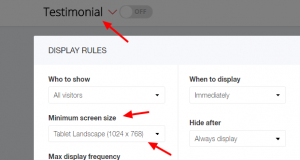 You may adjust settings with display rules on the setting page. The ‘exit intent’ display rule does not work on mobile devices – browsers do NOT allow us to ‘block’ when you visitor clicks the ‘back button’ so we can NOT detect ‘exit intent. Get more advice concerning our display options here. Please use our social mobile bar to display social buttons on mobile devices. If you added Zotabox to a 2nd wordpress site but it is displaying the settings from your 1st site, please follow these instructions to re-connect it properly. Please disable any wordpress cache plugin. Can I use my embed code on more than one website? Yes, you can use the same embed code on more than one site such as development site etc. Your websites will share the same tool settings and 14 day Premium Free Trial. You can also add another website to your zotabox account on the dashboard – My Account. Can I link my popups/tools to a custom link on my website? Yes, you can use this code to open a zotabox popup or any tool with a custom link on your website. You can see the Tool ID in your browser title bar when on the Zotabox setting page. You may need a developer to help you. Can I add multiple Zotabox tools to the same website? 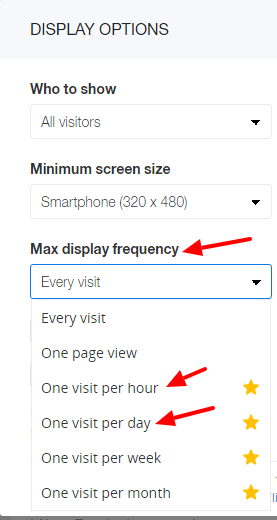 Please scroll over the top of the setting page to add another tool to your website. Can I get a copy of my latest invoice? Our credit card processing company – Fast Spring will email you a copy of your invoice after each payment to the email address on your account. You can also see your latest invoice (and edit your email address) on your account page (please access or login to your Zotabox account before clicking link). Yes, you may review our GDPR policy here and request a data processing form. You may also review our general privacy page here and link to Zotabox’s privacy page for your website visitors here. No, after you have added our zotabox app to your ecommerce platform (such as Shopify, Weebly, Ecwid, WordPress etc.) you do NOT need to manually embed the zotabox code again on your website. Doing so may cause conflicts. Please remove the manual embed code to fix this situation. How can I add Custom CSS to my tools? 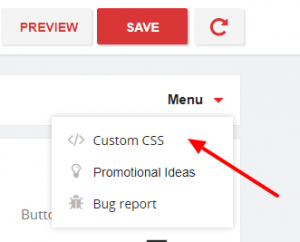 Custom CSS is available on all tool setting pages (below the Menu button). You can also add custom CSS for all tools on your Zotabox dashboard – settings – advanced settings. Can I add a phone #, SMS, skype etc. to a Zotabox button? Please refresh your browser cache – ctrl F5 to fix this temporary cache issue or wait a few minutes in case it is a temporary connection issue. If this problem persists, please email us at customerservice@zotabox.com and give us your website url. Does Zotabox 'auto-translate' our tools? 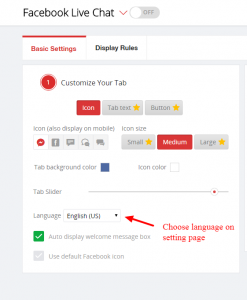 Zotabox does not ‘auto-translate’ your tools but you can add multiple tools (with different languages) to the same website and set page based display rules to display each tool on different pages. For example English tools on English pages etc. If you have different languages on different domains you can add another website to your Zotabox account on the dashboard. We are sorry, Shopify does not allow most 3rd party tools on their checkout page (only on the cart page and other pages). The only exception is our Advanced Discount Rules which work ONLY on the checkout page. These are Shopify restrictions. To test your ‘returning customer’ display rule, please open your website browser (using refresh website button on your zotabox setting page). Then close your browser and reopen again. (Please make sure your browser does not ‘remember’ your previous settings and re-opens your previously closed tabs – this will NOT trigger the ‘returning customer’ display rule). You can also ‘refresh’ your website browser on the zotabox setting page to test again. (this display rule will not work in private/incognito browser mode). Can I add custom tracking with GA or my Facebook Pixel? 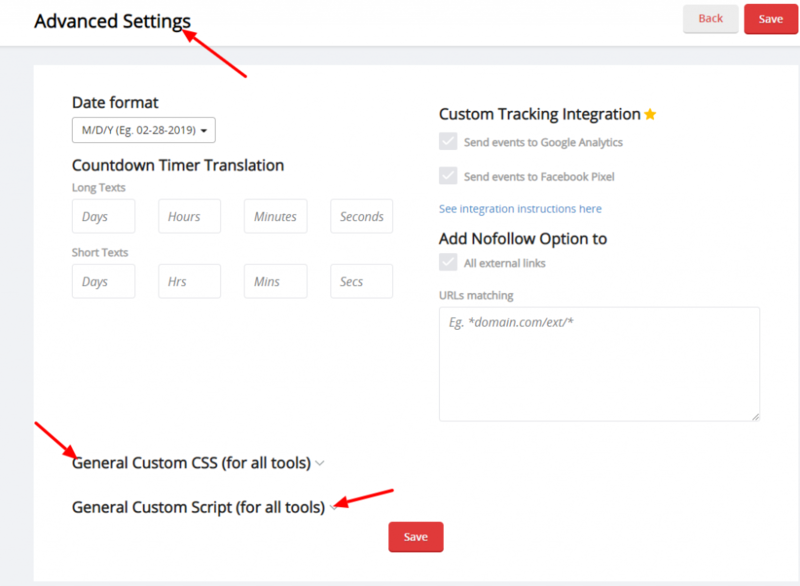 Yes, you can add custom tracking with Google Analytics or Facebook Pixel to your Zotabox account. Please go to your dashboard – settings – advanced settings. This FAQ will also help. Zotabox tools are not displaying on some of my EcWid pages. Please install the Zotabox embed code manually on your non-EcWid website pages to display the same zotabox tools on ALL your website. Shopify restricts applying discount or adding free gift to the checkout page only (we are unable to add to the shopping cart page). If you experience any issues, please remove other apps or plugins related to your checkout or cart to avoid potential conflicts. Can I use display Zotabox on my Tumblr pages? This article will give you instructions on how to embed our code on your Tumblr page. You can get your Zotabox embed code here after logging in or creating a new Zotabox account. For security reasons, please send us an email FROM your original email address TO customerservice@zotabox.com requesting the change to your new email address. If your sub domain is managed via a separated platform then you will need to embed your Zotabox code for your sub domain again. We are sorry. Zotabox does not do custom work on individual websites. Your developer can use our custom CSS to make custom changes to your individual tools. 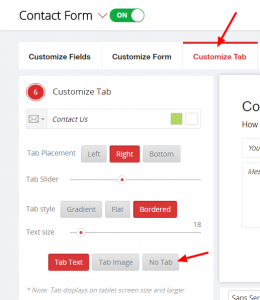 In some simple cases, Zotabox can do a quick one time customization at no additional charge. We are not a web agency and to keep our prices low we can not re-do or re-edit simple customizations. Zotabox is a package of 20+ promotional sales tools to increase your website sales and get you more email subscribers. You can explore all our tools on our Zotabox dashboard and preview tools on your website. You also have a 14 day Free Trial..
Zotabox guarantees you will increase your sales in 30 days or your money back. All our tools are customizable and responsive. You can add custom CSS and HTML to many of our tools. You can get free promotional ideas for your website here or see our beginner’s guide. Our FAQ section is also very handy. If you have any questions, you can email us at customerservice@zotabox.com or go to our FAQ page to quickly message us. We wish you the best with your website and hope we can create more sales for you today. Please log out and log in to your Magento admin page again. This will fix this cache issues. 1. Please make sure your browser popup blocker is disabled IF the blue ‘Connect Facebook Page’ button keeps loading. 2. You must have a https: website to install Facebook live chat (not http or local host). 3. You MUST have installed one of our Zotabox apps (ex. WordPress, Shopify etc) or manually embedded our code in your website admin to display our tools on your website. You can find our apps and manual code here. (You will need to create a Zotabox account first). 3a. 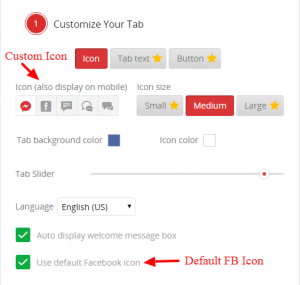 WordPress users, if the facebook icon does NOT display on your website please manually embed our general code to avoid conflicts with custom themes. 4. 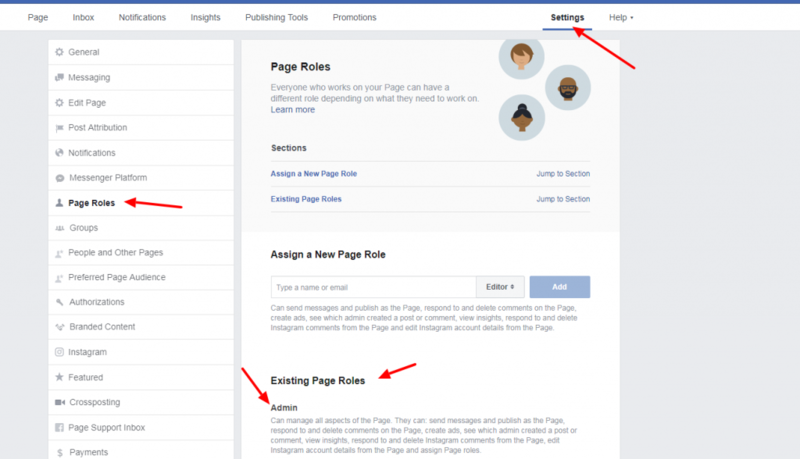 You must have admin access to the fanpage you wish to connect to and be logged in to the correct facebook account. 5. If you want to connect to another fanpage please disconnect on our setting page (and be logged into the correct facebook/fanpage account to re-connect to your new fanpage). 6. 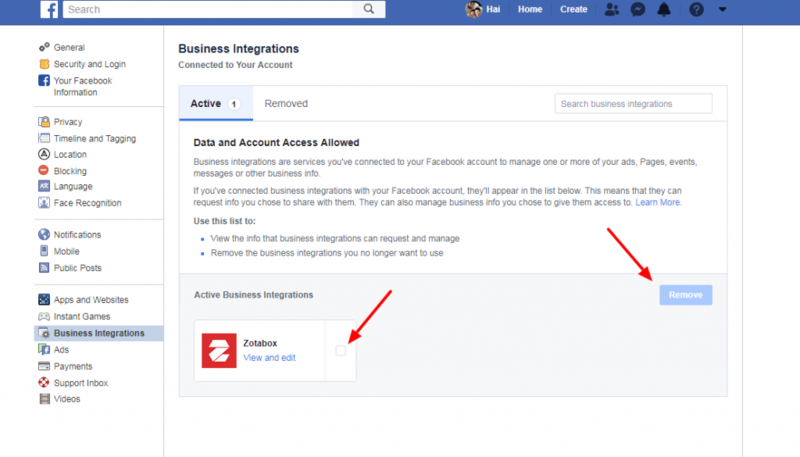 If you manage multiple fanpages, you need to remove our Zotabox app in your Facebook setting page. After you remove our app, connect again using the blue ‘Connect Facebook Page’ button on our setting page to update your permissions. 7. Zotabox is only responsible for displaying the live chat ‘icon’ on your website. 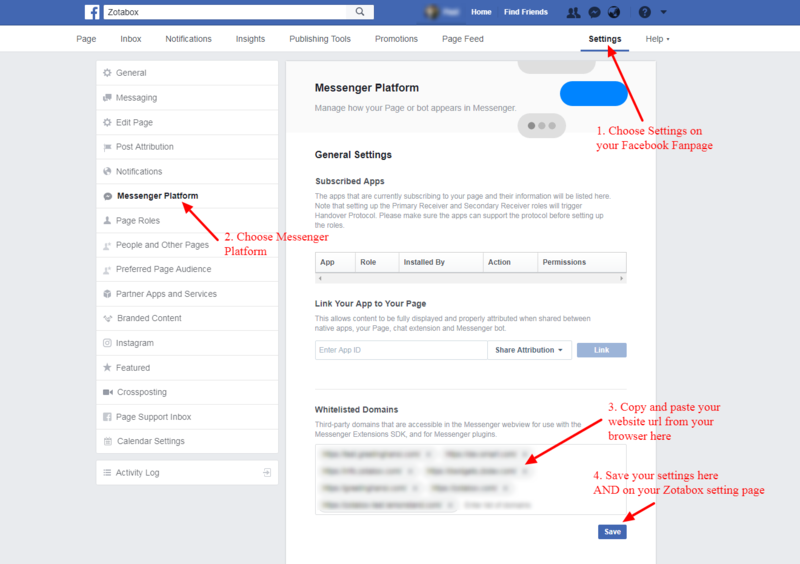 IF Messenger opens in a new tab instead of displaying on your website, you MUST meet ALL of Facebook’s requirements in this FAQ. We are sorry, Facebook has removed the ‘x’ to close the chat box and automatically opens the chat box when your visitor enters your site. We can not override this. Your visitors can click your icon or tab to close the chat box. Zotabox can only display the Messenger icon on your website. The chat window is 100% controlled by Facebook. To have the chat box display on your website (instead of redirecting to a new Messenger tab), you MUST meet the following facebook conditions. If you still have issues after meeting ALL these conditions, you will need to contact Facebook for support. 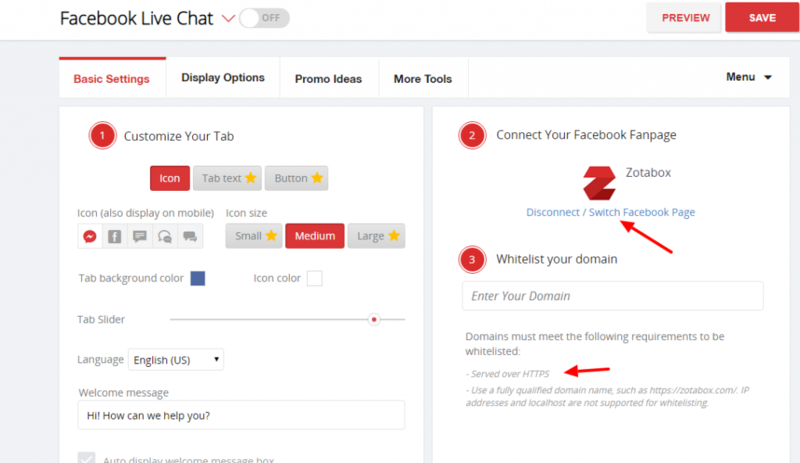 WHITELIST your domain in your fanpage settings and save on the Zotabox setting page (and refresh your website). (Be sure to copy and paste your website domain from your browser window to your fanpage Whitelist settings. You need to have admin access to whitelist your domain on your fanpage). Facebook chat will only work with fanpages or business pages (not personal facebook accounts). Have absolutely NO restrictions in your fanpage settings (including age, country, messaging, tagging, languages etc.) Live chat will NOT work with ANY restrictions on your fanpage settings. Your facebook fanpage must be PUBLISHED. Disable any ‘adblocker’ extensions in your browser settings. Refresh your website browser (ctrl F5) IF the live chat appeared on your site before. In some cases, Facebook will block a whitelisted domain. We do not know the reason and can not override this. Please contact Facebook support directly to help you in this case. (Our custom icon will open a New Messenger tab in this case). WordPress users, if you have whitelisted your domain (by copying and pasting your domain url) and the icon still does not display, please embed our code manually using these easy instructions to avoid conflicts with custom themes. A slow internet connection may cause the default chat icon to display slower or not at all. Please choose a custom icon to redirect to Messenger in this case. If you meet ALL of facebook’s conditions, please contact Facebook support. Zotabox is unable to help you in this case. (99% of merchants who meet ALL of the above conditions can display the live chat on their website). You maybe redirected to the Messenger app on mobile browsers IF you meet these conditions. 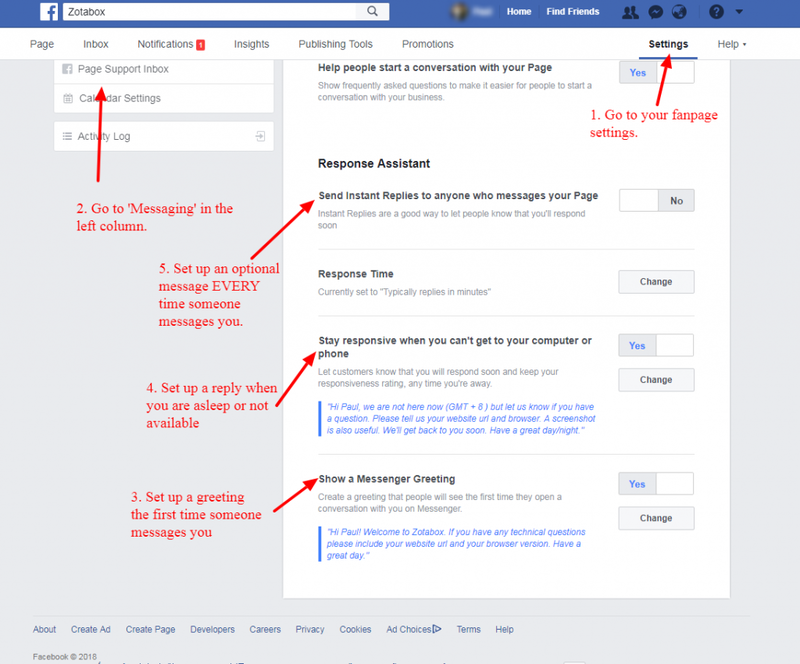 Do my visitors need a facebook account to message me? Facebook will ask your visitors to create a Messenger account if they do not have a Messenger or Facebook account already but with almost 2 billion active users on Facebook/Messenger most of your visitors will already have an account. Can I set up a greeting message or schedule? Everything ‘inside’ the chat box is controlled by Messenger. Please go to your facebook fanpage or business page “settings – messaging” to create a greeting, instant message and scheduling. The chat box on mobile devices is controlled by Facebook and your browser (ex. Safari opens Messenger on a new tab). B. You have an old operating system or mobile browser. C. Your visitor has not opened Messenger within their mobile browser before. Your visitor will be asked to login OR create a Messenger account and then will not be asked again. Note: Messenger will NOT auto open the chat box on mobile devices. Your visitor HAS to click the mobile icon. Messenger will display ‘full screen’ on mobile devices. This is a Messenger setting that we can not override. Redirecting to a Messenger is a browser/Facebook issue. Zotabox can not control this. Please make sure you also meet ALL of Facebook’s requirements to display live chat on your website. This message is from Facebook’s spam protection. Only a few of your customers will see this. We can not control who sees this message on our end. The chat tab remains open even when I set settings to closed. Facebook 100% controls the chat box, not Zotabox. 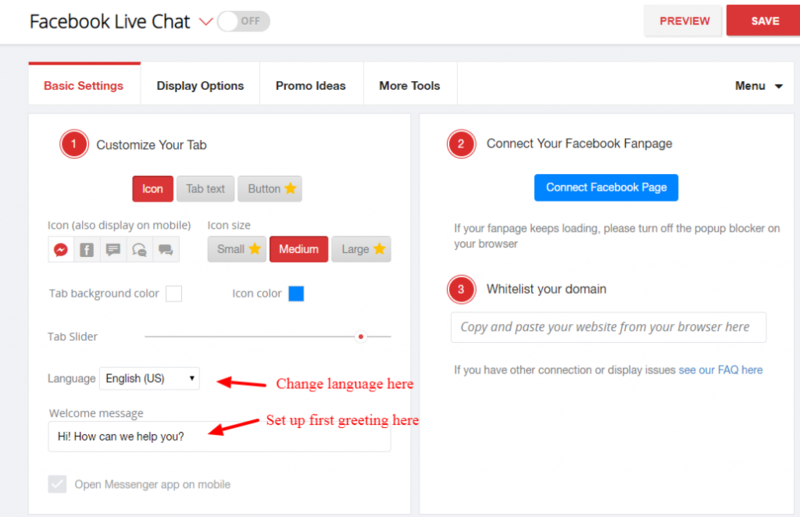 They have decided to always display the chat box to your website visitors. If your chat box does not display please see this FAQ. Please go to your facebook fanpage – messages to see incoming messages from your visitors. Your visitors will see your reply LIVE on your website in THEIR browser (you will see THEIR messages in your facebook fanpage). Please install the PAGES MANAGER app on your mobile device to receive messages on mobile devices. You need admin access to your facebook fanpage to see and respond to messages from your website visitors. Please install the Facebook Pages Manager app to manage mobile notifications for your business facebook fanpage. Be sure your notifications are turned ON for your “Pages Manager” AND your general phone notifications for “Pages Manager”. Also, make sure any ‘Do not disturb’ settings are turned OFF on your phone and ad blockers are disabled. This problem is caused when another facebook script on your website is overriding the language settings of our facebook live chat. You may need a developer to help you update the scripts on your website. We can not do this on our end. Do visitors have to click 'continue' before sending a chat? 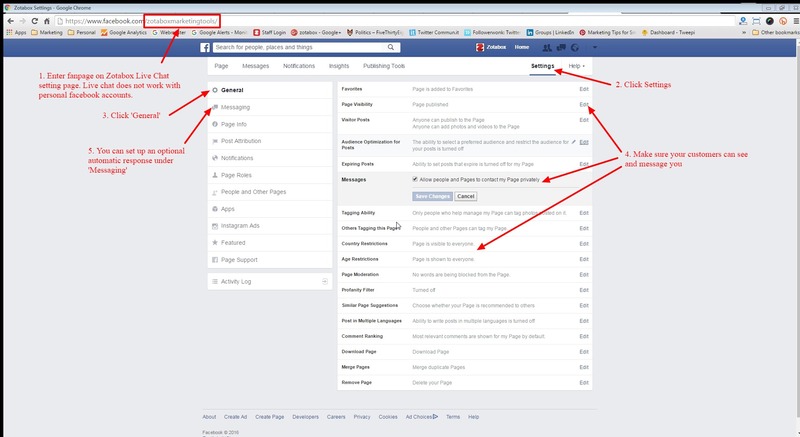 This is a feature of Facebook to protect your website visitors. Can I customize where the icon appears on mobile devices? Yes, you can use our custom CSS to customize where the icon displays on mobile devices. Your developer will be able to help or we can do a one-time simple adjustment (such as move icon or change color) for you at no additional charge. When testing, you will see YOUR social account (to share your website or ‘chat’). When your VISITORS come to your site they will see THEIR social account (when sharing your website or in the chat box). If you are not receiving emails with our contact form, please check your spam box and add mailer@zotabox.com to your contact list. If this does not work, try a @gmail.com recipient email address. If the @gmail address works, please tell your local internet service provider to ‘allow’ emails from Zotabox. Following these steps will solve this issue in 99.5% of cases. Yes, you can add multiple contact forms (and other tools) to your website using our ‘multi-tool feature on the setting page. 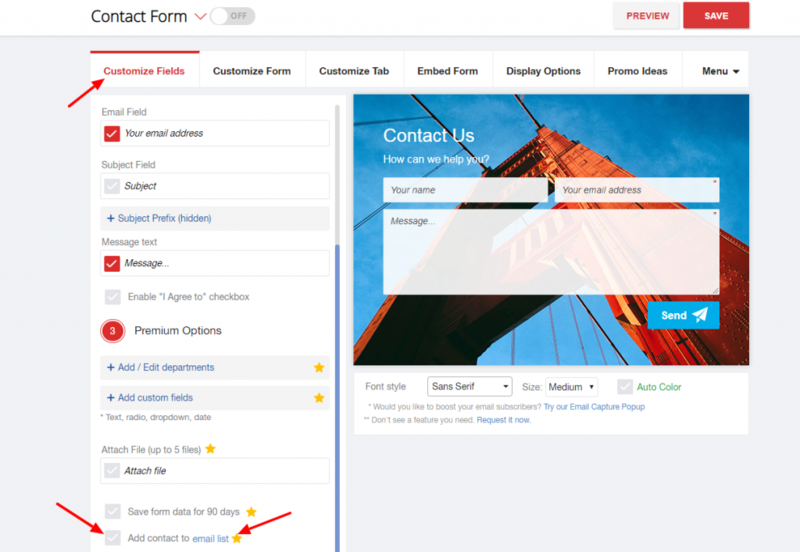 Please scroll over the top of the setting page to add another contact form to your website. Does my contact form integrate with Mailchimp? All correspondence is sent to your ‘recipient’ email address on the contact form setting page. 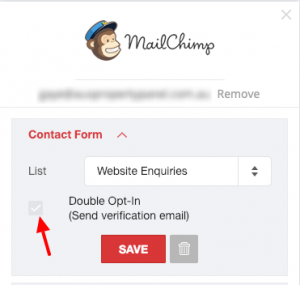 Visitor emails collected by using our contact form can integrate with Mailchimp when added to your email list by checking ‘Add contact to email list’ on the setting page. The merchant is responsible for complying with relevant privacy laws. You can also collect new email subscribers by using one of our email collection tools such as our Email Capture Popup or Email Capture Bar. Can I edit the 'sender email' - mailer@zotabox.com? We can’t set the customer email as sender because our email service only accepts verified email address (mailer@zotabox.com) to forward you messages from your customers. We set the customer email in the “Reply-To” field in the email header. So when you click reply, the email will be sent to your customer email address, not our sender email. Also, when you use our ‘auto-response’ the ‘actual’ sender will be mailer@zotabox.com but your customers will see your email address as the ‘reply to email’ and reply directly to you. Your visitors will NOT see mailer@zotabox.com when you reply to them. What kind of files can be sent via attachment? Your customers can attach up to 5 files of 5 MB each. We support most file types except program or executable files. Yes, you can. 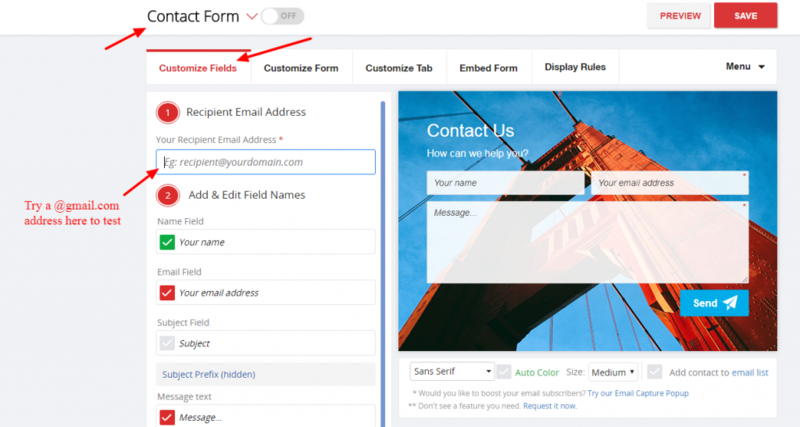 Please go to the ’embed form’ tab on the contact form setting page. (Shopify users can find some embed instructions on this page). Can I choose 'No Tab' for my contact form (and other popups)? Yes, please see the tab settings on the setting page to select the ‘No Tab’ option. 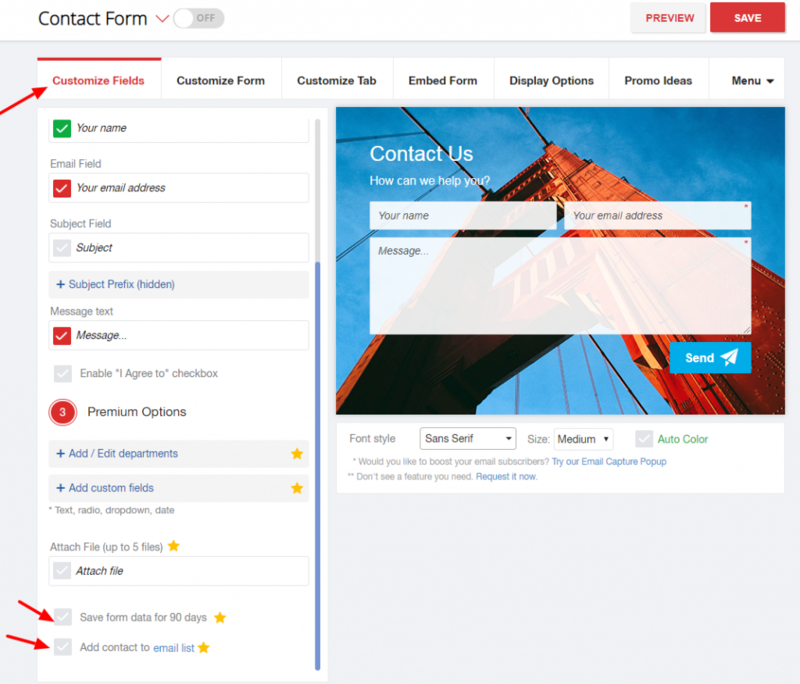 Can I increase the contact form width? Larger images do not look good on all screens. You can not override its width using custom CSS. Where can I find my new email signups? Your email subscribers are on the dashboard -settings – new subscribers – https://zotabox.com/dashboard/subscriber. Can I change what images/products facebook shares? Facebook automatically chooses what images etc to use when your visitors ‘share’ your website. You can ‘tell’ Facebook what images to share by using the following code. 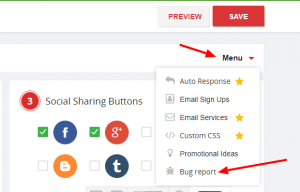 Here are some quick instructions to embed social meta tags to Shopify theme. If your image displays incorrectly in your facebook post, your site needs to have a ‘ og:image ‘ tag to display your image correctly. You may need to speak to a developer to help you with this issue. What is the difference between 'share' and 'follow'? On some social tools you can choose to allow your customers to ‘share’ your website with their friends OR ‘follow’ your social account. For the ‘share’ option we do NOT need your social account information. Currently, our social mobile tool only allows the ‘share’ option. The ‘follow’ option is available on our other social tools. We hope to add the ‘follow’ option to other tools in the near future. Thank you for your patience. The Social Mobile Bar only supports the ‘share’ your website option (not the ‘follow’ your social account – except Youtube and Instagram). 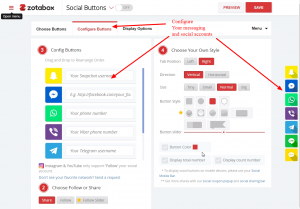 If you choose ‘follow’ your social account on desktop (or Youtube or Instagram on mobile), please enter your social account on the ‘configure’ or ‘Update’ tab on the Zotabox setting page. How can I add my social account to my Zotabox tools? Please choose ‘follow’ your social account then ‘configure’ your social account to add/edit your social account. Please note that the social mobile bar only offers the ‘share’ your website option (not the ‘follow’ your social account). How do I set up and use the Messaging Buttons (QR codes)? Please ‘configure’ your messaging buttons on the setting page. Your website visitors will need to install a QR code reader on their mobile phone to read your code and message you on their mobile device. Your customer must also have the messaging app installed on their phone to message you via Whatsapp, Messenger etc. Instagram only supports the ‘follow’ your social account option, not ‘sharing’ your website option. Please enter your instagram account on the 2nd tab on your Zotabox setting page. Our social buttons are currently not ’embeddable’. We intend to add this feature in the coming months after we complete our current priorities. Your website visitors need to have whatsapp installed on their mobile device or computer to use our whatsapp (contact or share) button. This is a limitation of whatsapp. They currently do not request ‘non-users’ to automatically create an account. The share totals (per your website page) come directly from the social networks. Zotabox can not change or alter these totals. To compare your totals to a 3rd party provider, please enter your page url at sharetally.co or sharedcount.com. Some networks, no longer support share totals. Ex. Twitter and G+. Youtube does not support custom channels. Ex. https://youtube.com/c/…. Please use this format – https://youtube.com/channel/…. 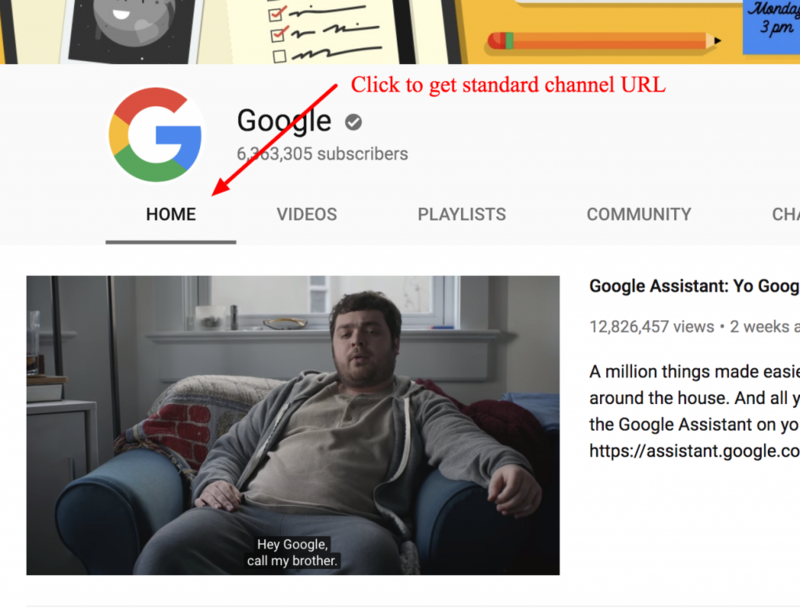 Click on ‘Home’ tab above video (not the home tab in left column) to get standard channel url and copy and paste in Zotabox setting page. Can I display the Testimonial tool on mobile devices? We are sorry, the Testimonial tool displays on tablet size screens and larger (they do not look good on smaller mobile screens). Can I use the testimonial tool to promote my products? Just upload images of your products and edit the descriptions. How can I test my EU bar in Europe? We recommending using a European proxy server such as Zenmate to test your website in EU countries. Choose where and when to show your promotions to achieve maximum effect. This maybe the most important consideration when setting up your new promotions. You may not want to display your promotion on every page of your website. You can also select to display/don’t display on some pages such as your cart/home page/FAQ page etc. (Note: Shopify does not allow 3rd party tools on the checkout page). You can get creative with certain tools such as popup to display ‘on exit’ on certain pages only, IF you would like to reduce cart abandonment or if your visitor exits a certain product page (or category). Do you want to display your promotions to all visitors? Maybe not. Maybe you want to show your news or promotion to returning visitors who are familiar with your site. How about first time or new visitors? You can give them a special ‘don’t go away’ discount’ that your regular visitors will not see. 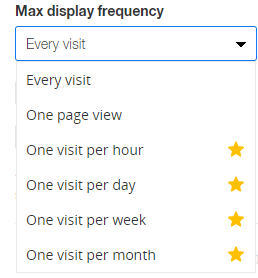 You can also choose to display to ‘active visitors’ who have clicked 3 or more times or visited 2 or more pages. Great to target your best visitors with a email capture request (give something in return such as a discount or free gift 🙂 ). Be creative with your promotions. Your visitors may not want to be bombarded on the first page immediately with promotions. You can choose to display your promotions after a few seconds, when your visitor scrolls a percentage down the page or on exit. Some tools also give you the option of hiding the tools after a period of time. 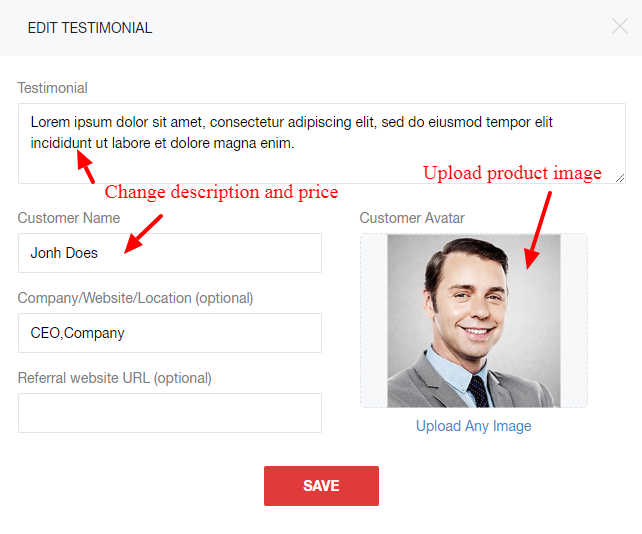 Useful for say testimonials or simple news where you can free up space on your site after your visitor has read the important information. Our popups offer maximum display frequency to match your website needs. Do you want to remind your frequent visitors of your offer every visit or less often? Note: ‘Every visit’ depends on your visitor’s browser settings. If your visitor’s browser sessions remain ‘open’ for long periods they may NOT see your popup every visit. 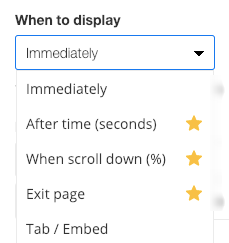 In this case we recommend choosing ‘one visit per hour’ to display your popup more frequently. Please refresh your website browser when testing by adding /#zbrefresh to your website url (ex. https://mywebsite.com/#zbrefresh) to avoid temporary browser cache issues. Do you want to ‘target’ your promotions by city or country. You can do that with our display options. For example, you may only want to offer free shipping to US residents. 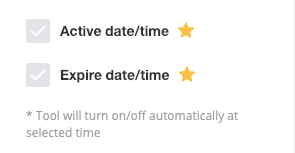 You can set an activation and/or expire time for your Zotabox tools. Just set the dates and time you wish and your tools will turn on/off at your selected local time. Note: If you use a countdown timer on any of your tools, your tools will automatically turn OFF when the timer reaches zero (or when the expire time has been reached, whatever comes first). 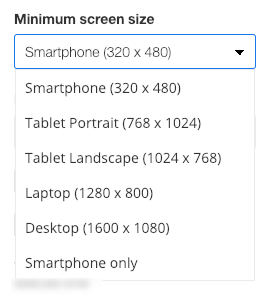 Sometimes you may not want to display certain tools or promotions on mobile devices (or display ONLY on mobile devices).. You can preview your tools on the setting page for different devices. Note: Some tools automatically do NOT display on smaller mobile screens. With our ‘multi-tool’ feature you can add multiple popups, header bars, contact forms etc to the same website, each with custom display options. Note: You can set up a ‘general settings’ for all/most of your tools IF all/most of your tools will have the same display setting. Some tools like our header bar or social mobile bar give merchants the option to set ‘fixed or scroll’ so the tool will remain in place when your visitor scrolls down the page (fixed) or move with the page when your visitor scrolls (scroll). 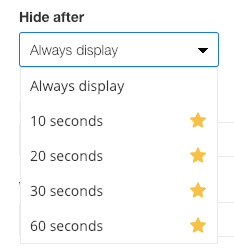 Be sure to save your new display settings and refresh your website on your setting page to see the new changes. We love to hear your suggestions and comments. Please write to us at customerservice@zotabox.com. We may think your idea is great and implement it right away but we generally prioritize new suggestions based on the number of requests that we receive. Non – EU merchants/websites please ‘uncheck’ the ‘Display in EU countries only box’ to test your website. Please also REFRESH your website on the setting page or add /#zbrefresh to your website url. The default Weebly Cookie bar blocks all other 3rd party app cookies so our cookie bar can’t work properly. 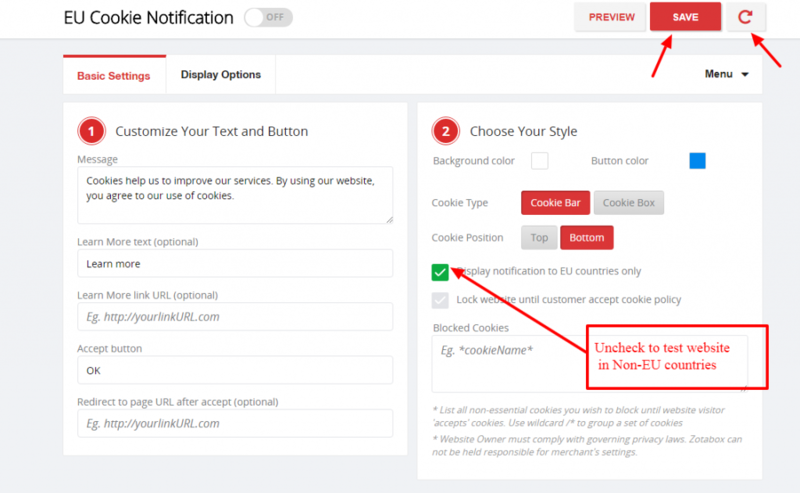 Please contact Weebly to disable the default cookie bar to fix the problem in this case.